271 - 274 Tetricus was governor of Acquitaine in Gaul when Victorinus, the emperor of this secessionist region, was murdered. 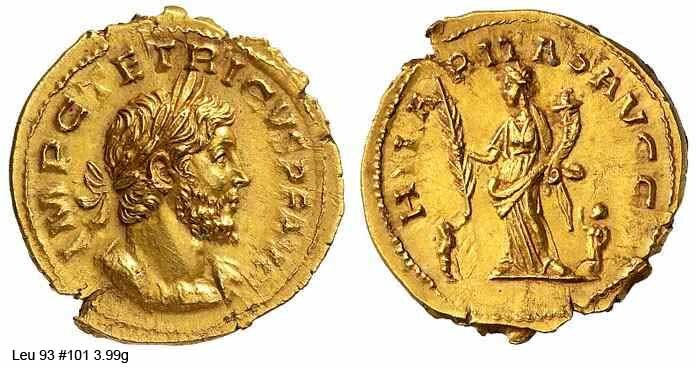 Victorinus' mother, who evidently had a certain degree of influence in the army, then appointed the Governor to emperor. 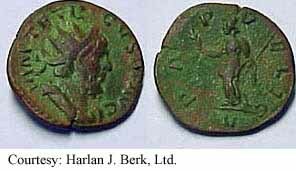 The reign of Tetricus was potmarked by a string of battles against loyalist Romans, other secessionist states, would-be crown usurpers and barbarians. 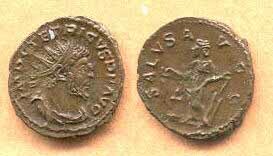 It all finally ended when Tetricus arranged for surrender to the forcecs of Aurelian in exchange for his life. The plot was carried off and Aurelian subsequently pardoned him as well as appointed him to office either as governor of Lucania or as corrector of Italy. Contemporary historians relate how the two former adversaries retained a strong friendship. RIC 7, Schulte 50a, C 130 Aureus Obv: IMPCTETRICVSPFAVG - Laureate, cuirassed bust right. Rev: PMTRPIIICOSIIPP - Tetricus I standing right, stepping on globe, holding spear and parazonium. c.272-273 (Colonia Agrippinensis). 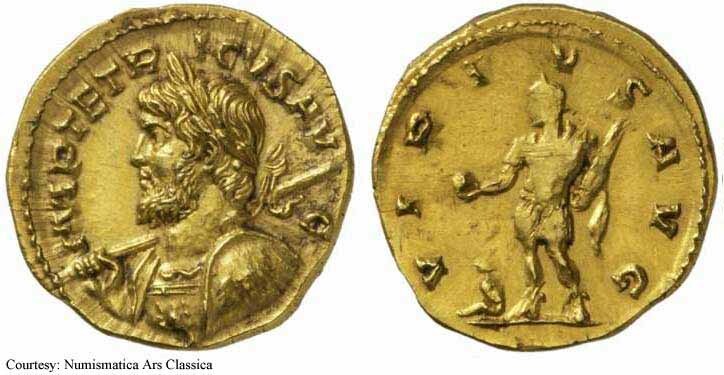 RIC 13, Schulte 71a, CalicСѓ 3870 Aureus Obv: IMPCTETRICVSPFAVG - Laureate, cuirassed bust right. Rev: HILARITASAVGG - Hilaritas standing left, holding palm and cornucopia; child on either side. Dec 273 - Apr 274 (Treveri). $36,641 5/10/05. RIC 21, Schulte 21a, C 202 Aureus Obv: IMPCTETRICVSPFAVG - Laureate, cuirassed bust right. Rev: VIRTVSAVG - Virtus seated left, holding branch and spear. c.272-273 (Colonia Agrippinensis). Unlisted RIC, Schulte 34a, Elmer 820 Aureus Obv: IMPTETRICVSAVG - Laureate, cuirassed bust left, holding spear over shoulder and shield. Rev: VIRTVSAVG - Tetricus I standing left, holding globe and parazonium; seated captive to left. $29,875 12/5/02. 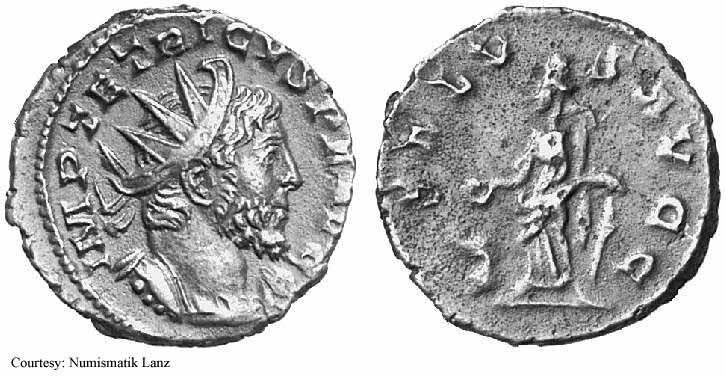 RIC 56 Antoninianus Obv: IMPCTETRICVSPFAVG - Radiate, draped and cuirassed bust right. Rev: COMESAVG - Victory standing left, holding wreath and palm. 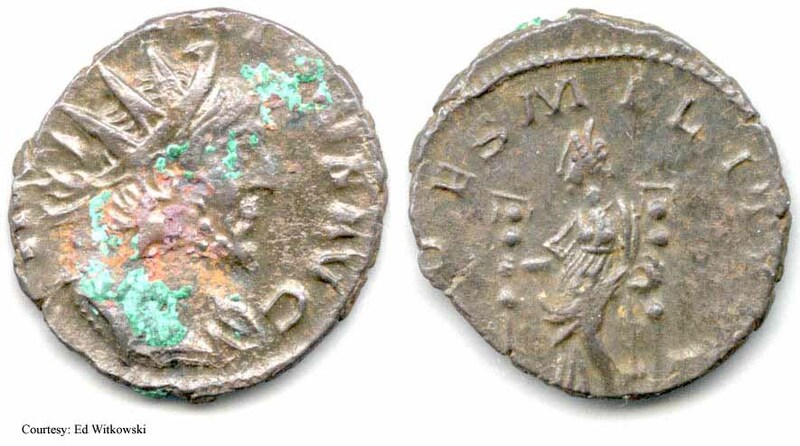 RIC 57 Antoninianus Obv: IMPTETRICVSPFAVG - Radiate, draped and cuirassed bust right. Rev: COMESAVG - Victory advancing left, holding wreath and palm. 272-273 (Treveri). 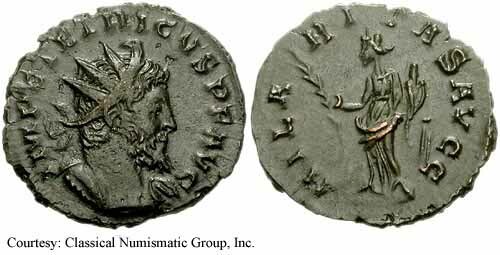 RIC 71 Antoninianus Obv: IMPTETRICVSPFAVG - Radiate, cuirassed bust right. Rev: FIDESMILITVM - Fides standing left, holding a standard in each hand. 273-274 (Colonia Agrippinensis). RIC 79 Antoninianus Obv: IMPCTETRICVSPFAVG - Radiate, cuirassed bust right. Rev: HILARITASAVGG - Hilaritas standing left, holding palm and cornucopia. 273-274 (Colonia Agrippinensis). $75 8/1/04. RIC 80 Antoninianus Obv: IMPTETRICVSPFAVG - Radiate, cuirassed bust right. Rev: HILARITASAVGG - Hilaritas standing left, holding palm and cornucopia. 273-274 (Colonia Agrippinensis). RIC 88 Antoninianus Obv: IMPTETRICVSPFAVG - Radiate, cuirassed bust right. Rev: LAETITIAAVGG - Laetitia standing left, holding wreath and anchor. RIC 100, C 95 Antoninianus Obv: IMPCTETRICVSPFAVG - Radiate, draped bust right. Rev: PAXAVG - Pax standing left, holding branch and scepter. 272-273 (Treveri). $28 9/20/03. 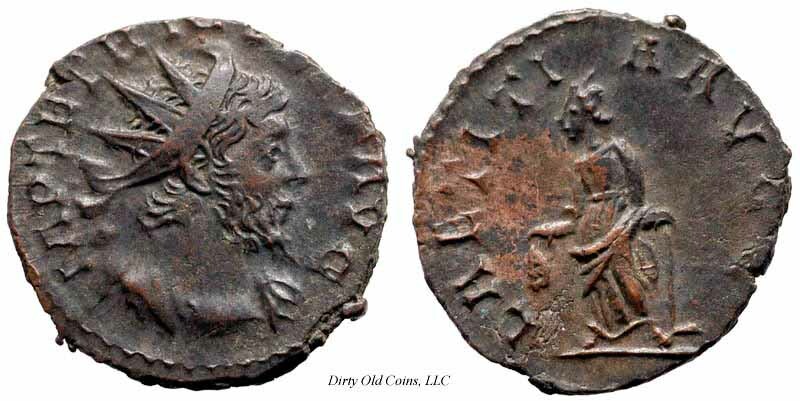 RIC 126c, C 154 Antoninianus Obv: IMPCTETRICVSPFAVG - Radiate, draped and cuirassed bust right. Rev: SALVSAVGG - Salus standing left, feeding snake on altar and holding rudder. RIC 127f, C 152 Antoninianus Obv: IMPTETRICVSPFAVG - Radiate, cuirassed bust right. RIC 128 Antoninianus Obv: IMPCTETRICVSPFAVG - Radiate, draped and cuirassed bust right. 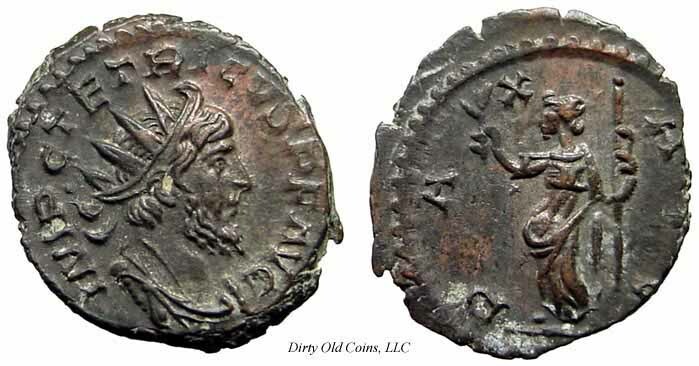 RIC 136 Antoninianus Obv: IMPCTETRICVSPFAVG - Radiate, draped and cuirassed bust right. Rev: SPESPVBLICA - Spes advancing left, holding flower and raising skirt. RIC 141 Antoninianus Obv: IMPCTETRICVSPFAVG - Radiate, cuirassed bust right. Rev: VICTORIAAVG - Victory advancing left, holding wreath and palm. RIC 148 Antoninianus Obv: IMPCTETRICVSPFAVG - Radiate, draped and cuirassed bust right. Rev: VIRTVSAVGG - Virtus standing left, resting hand on shield and holding spear. 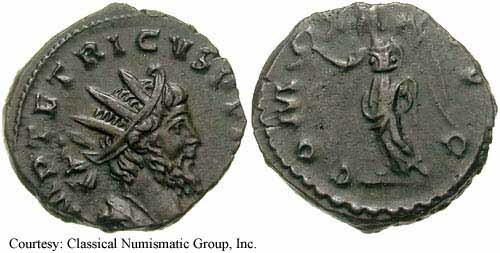 Unlisted Antoninianus Obv: IMPTETRICVSPFAVG - Radiate, cuirassed bust right. Rev: PAPVBLIC - Pax standing left, holding branch and scepter.